Have you failed your resolution? The number one resolution people set is to lose weight and over 80% of New Years resolutions aren’t kept past February. The percentage of failed resolutions isn’t surprising when Googling “Detox Diets” yields over 8 million results. Dietitian Kerry was featured on Fox 32 Good Day Chicago last week debunking three detox diet myths. 1. Juice Cleanses They’re very popular this time of year…. X percent have admitted to trying one. They’re typically marketed to consumers for a few days to weeks at a time and can cost upwards of $200. 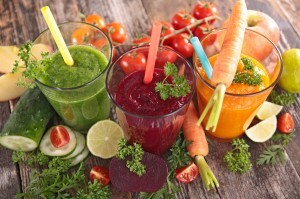 Juice cleanses to that claim to clean your body of it’s impurities are a myth. Your bodies Kidneys naturally clean your blood 400 times per day! These juice cleanses can contain over 40 grams of sugar per bottle and over 130 grams of sugar per day, which is more than 5 times the recommendation put forth by the American Heart Association. Instead, try drinking at least 8 cups of water per day for healthy adults. Try adding herbs and fruit to your water to boost the taste, like grapefruit and basil or mint and strawberries. 2. Liver Cleanses The idea that a pill will leave your organs squeaky clean is not science based. These are typically marketed as pills, hydrotherapies or even teas that cost $50-$100. The myth here is that your liver already serves over 500 functions, including breaking down all foods, drugs, alcohol, viruses and specially, toxins. Keep your liver healthy naturally by consuming quality proteins throughout the day, like salmon, eggs, beans, chicken, turkey and even dairy products like yogurt! Also, maybe opting to skip the alcohol this month would save you calories and help your liver focus on all its many other jobs. 3. Colon Cleanses These naturally sound disgusting and claim to make you lose quick weight. It is true that your entire digestive tract houses 70% of your immune system (to fight of infections) and over a tennis court worth of area to absorb nutrients from the foods we eat. You can keep this healthy by eating at least 5 servings of fresh fruits and veggies daily. Keep em colorful with grapefruit, cauliflower, peppers, pomegranate, blackberries, asparagus and many more!